I have a quick, easy, and eye-catching little project to share for the week. All you need is a basic white canvas, old doilies or lace, and a can of spray paint. I did not document the process portion of these with pictures, but it’s fairly easy to explain. If you want one of the colors in your artwork to be white, just let your canvas alone as a base. However, if you want a different color as a base color, paint over the entire canvas with that hue and allow to dry. 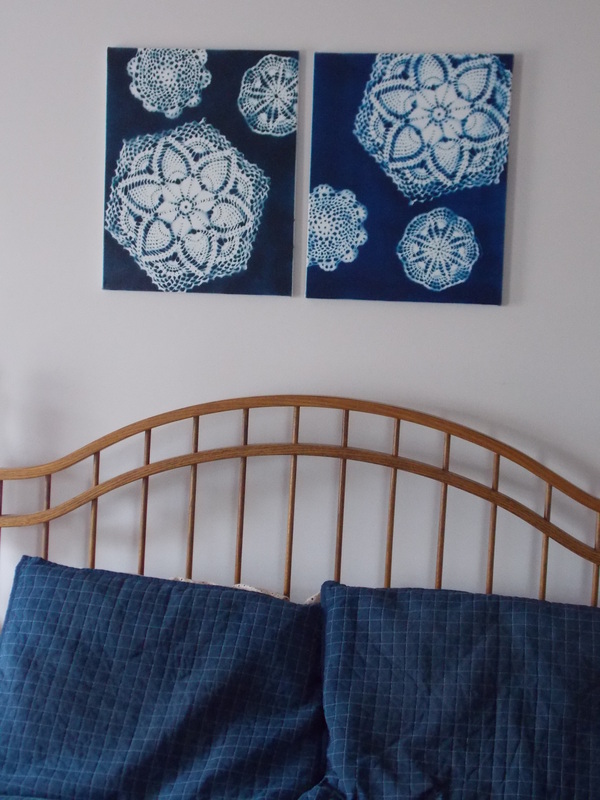 Then you can lay out old lace doilies in a design that appeals to you and make sure they are lying flat on the canvas ( no curled edges). Take a can of spray paint in a contrasting color (in this case, navy blue) and spray on a nice layer of paint. If you need to, allow that to dry without removing doilies and spray on another layer to get a saturated color. 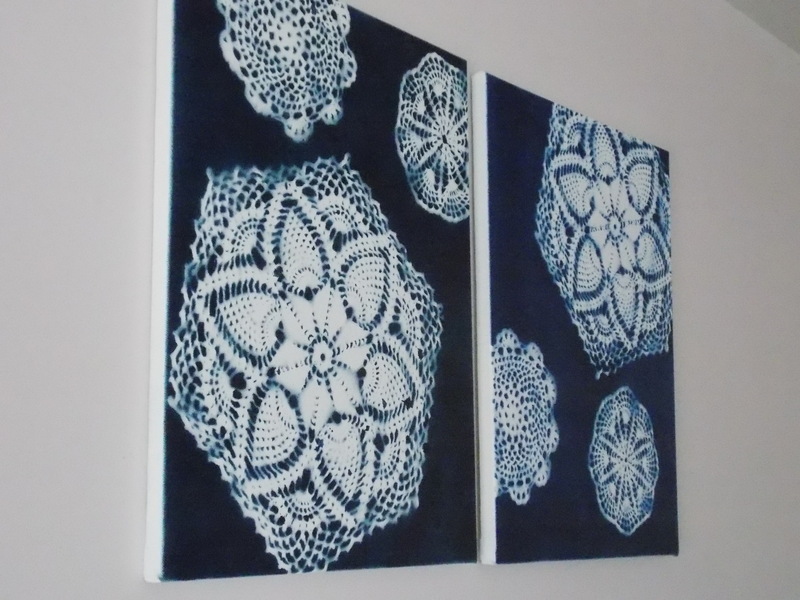 Once everything is dry, pull off the doilies and admire your new artwork! As you can see, I made a couple of these and placed them above the headboard of my bed. Actually, I may make another just because I think a trio would look better. 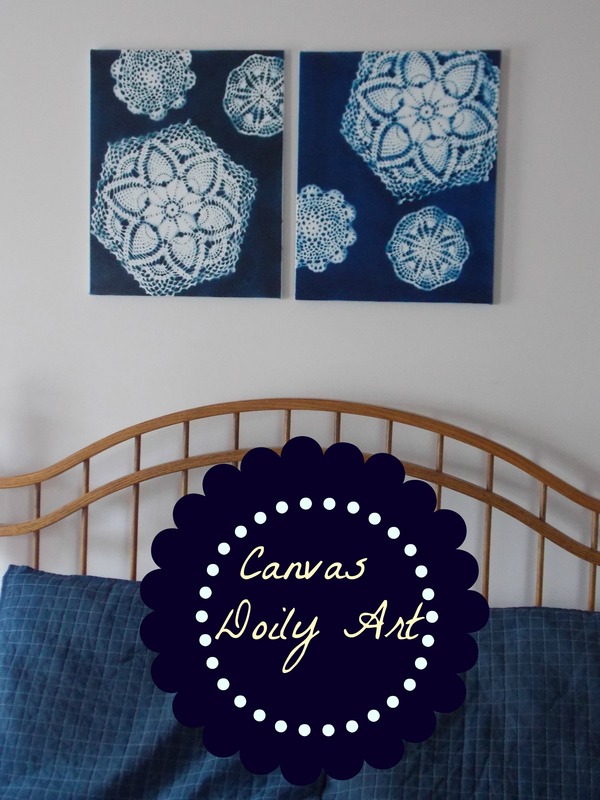 This is a semi-cheap project to make because plain white canvases can be purchased relatively inexpensively at Wal Mart or a craft store. 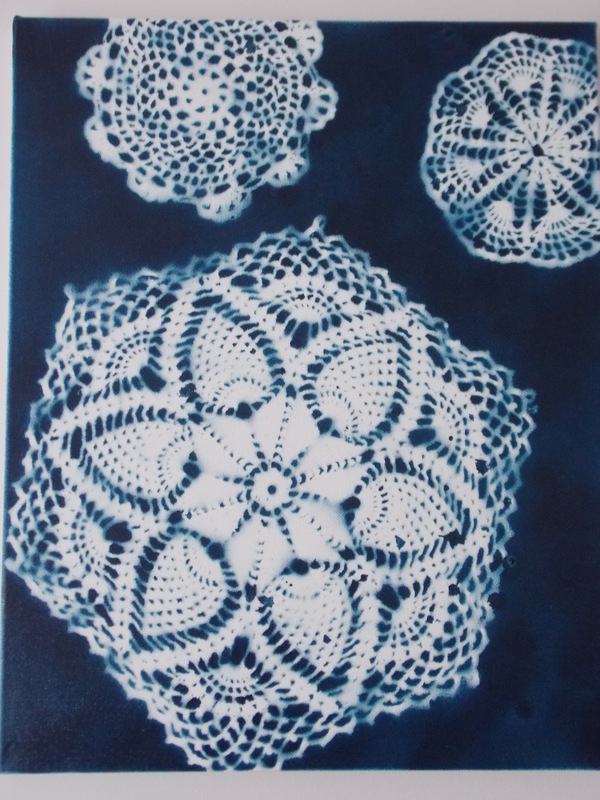 Old doilies or lace can be scooped up at thrift shops or even yard sales. They can also be reused for this type of project. Laying a piece of old lace over the entire canvas makes for a neat look too. I used spray paint because it goes in all those little holes better than a brush-on paint ever would. Love my new wall art! “When it rains, it pours.” I’m sure you’ve heard that one before, haven’t you? Or perhaps you’ve felt like this is what has happened to you. Not just one or two things in a row that go wrong, but a multitude of them. To be completely transparent with you, this is how I feel about the last few months. Our family has been hit with one mishap after another. Just when I think to myself that surely this is “it” for awhile, something else happens. It all started with a fender bender I had on Black Friday and things have pretty much gone downhill from there. Nothing that is the end of the world in the grand scheme of life, but still…here’s just a little sampling of our life in the last 3 1/2 months: one fender bender, 3 separate flat tire incidents, an oven that caught on fire, frozen water pipes, septic issues, one broken humerus, one injured wrist (a week after being released from the broken arm–same kid, different arm), anxiety issues at school, and I could go on but I’ll stop there. The topper was this past week when my husband’s vehicle had to be in the shop for a few days to repair a head gasket, plus some other goodies that the mechanic found when digging under the hood. We literally picked up his car Friday night–after paying a mucho hefty garage bill that made me cringe. 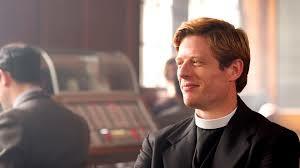 “Good grief, hopefully this is IT!” I really said that to myself and out loud to him. Yup, things were looking up….that is, until the very next morning when he hit a tree that fell into the middle of the road and couldn’t slam the brakes in enough time. With the same car we had just shelled out big bucks to fix. Oh, my poor man. Thank the Lord he was safe. The car, however…not so good. I could have cried, but held it together until after we had the police come out, cut the offending tree up and moved it so no one else suffered the same fate, and determined that we actually did not need a tow like originally thought (big praise here–it was actually drivable and not messed up underneath!). We got ourselves home and held each other, not even knowing what to say or how to react. Well, after a few minutes I happened to look over at our counter where my husband typically places his wallet, and there was a pile of crumpled dollar bills and coins. “Where did that money come from?” He didn’t put it there, and I know I didn’t put it there. Well, my pure hearted Andrew, my child who has struggled the most this winter, came out to the kitchen with a sheepish look on his face. Ever seen an ugly cry? Oh my heavens, I cried buckets and Jeff was just barely holding it together. We hugged our boy and assured him that everything was going to be fine, we have money in our savings, and he could keep his own money for other things. 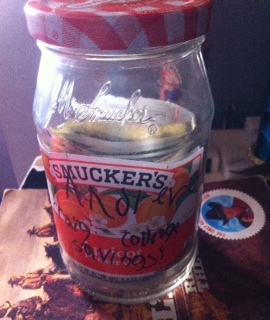 My sweet boy had emptied his little jelly jar marked “Andrew Craig- College Savings” to try and help us out. I could still cry all over just thinking about it. What a beautiful example of sacrificial love. It blew me away. Well, hopefully things are looking up from here. Sure, it’s been a rough one, but God is good. He never told us that we wouldn’t have troubles, did he? In fact, I’m certain it states in the Bible that we WILL have them. Thankfully I can trust that He only wants what’s best for us and we’ll just lean on that promise right now. I hope you enjoyed my little story. It touched me so much that I just had to share it with you all. I am starting a new kind of series here. Every month I plan to share a “What I’m Into” post. It can be books, TV series, food, or whatever I’m “into” that particular month. I enjoy these on other people’s blogs, so hey, why not give it a try here? I may also include things that my family overall is into as well. Cornelia Funke books. I read Inkheart a couple years ago, but now I am reading Inkspell. Yes, they are chapter books for probably later elementary to middle schoolers, but I enjoy them. 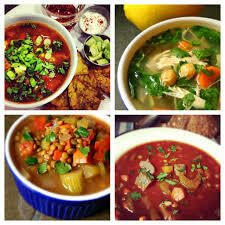 Soups and stews. I could eat soup pretty much every day no matter what the season, but have been making lots of them these last months. My go-to dinner option is to make a soup or stew with either bread, biscuits, or some of my skillet cornbread. As a family, we are currently obsessed with the series “How the States Got Their Shapes.” We discovered it on Netflix last month and love it! This is a great show for learning all kinds of US history and geography, but it is also just plain interesting. Yarn. 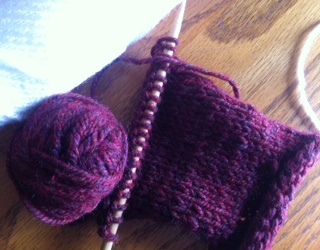 This winter I have done a lot of knitting and crochet projects. Currently I am finishing up a crochet tank top that I *think* (fingers crossed) will be cute for summer. I’ll have to let you know how it turns out. Breathe by Priscilla Shirer. I have just begun leading this new Bible study series with my ladies from church. It addresses the issue of creating margin in one’s life, the Sabbath, and not being a slave to busyness. A blog post just addressing this may be impending, but I’ll see what all I learn from the study first. I believe this is quite a timely issue for today’s culture, don’t you think? 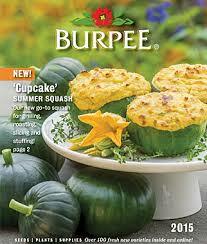 Lastly, our family has been poring over the latest Burpee catalog for the last couple of months. It is extremely dog-eared from being looked at and pages marked with possible things to plant this year. We are SO ready for spring!!! Hey everyone! I realized that it has been awhile since I put any crafty ideas on here. Anyway, today’s project is one that has actually been made and in use for many years at my house already. 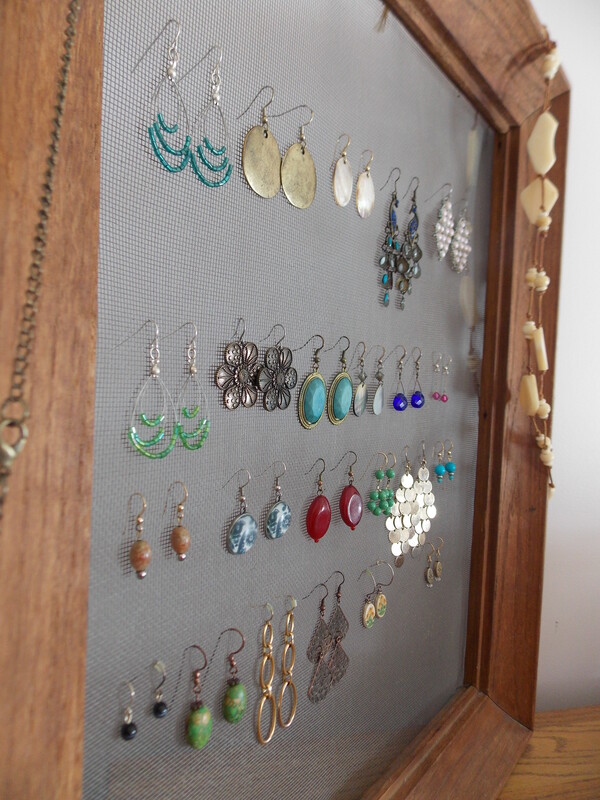 It’s not really a new or novel idea, but one that I think looks nice and keeps my dangly earrings semi-organized. I was on a purging/organizing spree the last two weeks and cleaned up my jewelry area, so I figured I would share my earring organizer and display. There really isn’t much of a tutorial for it. Basically I had been given an antique wooden picture frame minus any glass. All I did was clean it up and cut a rectangle of window screen out that more than covered the front open area. Then I proceeded to use a heavy duty staple gun to attach the screen to the back part, stretching it out as I went so it was taut. 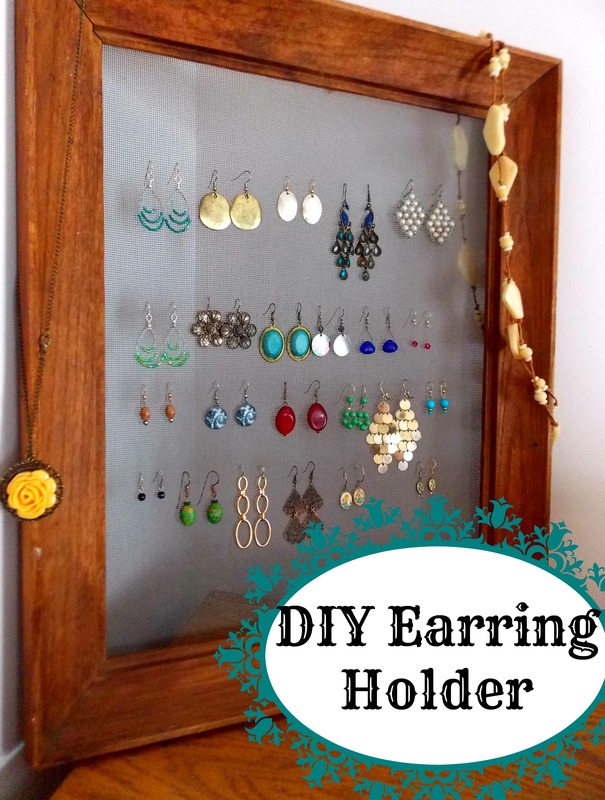 One could also use chicken wire, lace, or anything else with holes that you could hang earring hooks onto. I enjoy seeing some of my favorite pairs hanging up in rows. I used to make a lot of jewelry, so probably over half of these are ones I’ve put together at one point or another. 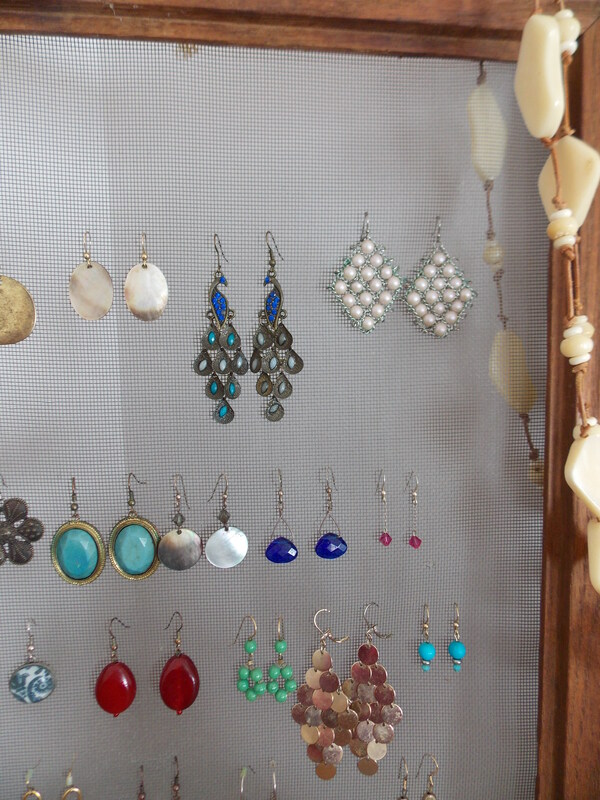 All of my post-style earrings are kept in little pinch pots that my kids have made in art class at school. Anyway, that’s really all I have for you today. Nothing earth shattering or new, but something that does work well for me. Happy March to everyone. I am more than ready for Spring to arrive! !